Canada’s health agencies have already issued a travel advisory and the Centers for Disease Control and Prevention (CDC) is mulling whether to follow suit in light of evidence suggesting the Zika virus may be behind a rash of birth defects in Brazil. There is growing concern that this mosquito-borne illness can cause microcephaly, a potentially catastrophic condition in which the brain remains underdeveloped, resulting in miscarriage or lifelong defects ranging from intellectual disability to seizures and quadriplegia. The Zika virus is a “viral cousin” to dengue fever and produces many of the same symptoms but in a milder and non-lethal form. The virus was largely limited to Indonesia, Asia, and the Caribbean until 2015, when it began to appear in Latin American countries and Mexico for the first time. In Brazil, the arrival of Zika coincided with a massive spike in microcephaly cases. In 2015, the country saw 3,530 incidents of the condition compared to fewer than 150 in 2014. Tests by the CDC have found Zika virus in the brains of at least two Brazilian babies that died from microcephaly and Brazil’s own researches have noted cases where the virus had managed to infect amniotic fluid. The link between the virus and microcephaly is not absolutely certain at this point, and establishing a firm link is going to require animal tests rather than analysis of emerging cases. 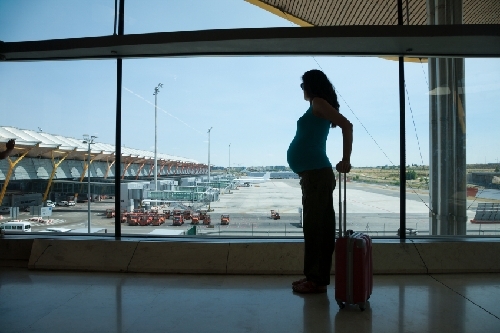 Still, the correlation is concerning enough to prompt a travel advisory to any pregnant women who are traveling to any countries experiencing Zika outbreaks. The overall risk to the women is considered low, but they are advised to wear long sleeves and take other protective measures against mosquitoes. There are many other viruses around the world that can cause birth defects if they infect a pregnant woman, but Zika is unique in having drawn a travel notice. This is partially because Zika initially appeared mild before the potential link to microcephaly emerged and caught people by surprise. As with most defect-causing diseases, the most danger is to women in their first trimester who may not realize they are pregnant. About 80% of people infected with Zika do not show symptoms but can be carriers and will infect mosquitoes that bite them. In those who do develop symptoms, they will often experience fever, headache, red eyes, joint and muscle pain, and a rash. As mentioned above, symptoms are mild and they can pass within a few days. No vaccine or specific treatment for the virus exists at this time, though research is ongoing. Similar to other mosquito-borne viruses, Zika could theoretically spread to Hawaii, Florida, and other southern states. In fact, the same type of mosquito that carries dengue fever—which Hawaii recently dealt with an outbreak of—is capable of carrying Zika. Fox, M., “U.S. Health Officials Consider Travel Warning As Zika Virus Spreads,” NBC News web site, January 14, 2016; http://www.nbcnews.com/health/health-news/u-s-health-officials-consider-travel-warning-zika-virus-spreads-n496521. “Zika Virus Infection in the Americas – Travel Health Notice,” Public Health Agency of Canada web site; http://www.phac-aspc.gc.ca/tmp-pmv/notices-avis/notices-avis-eng.php?id=143, last accessed January 15, 2016. “Zika Virus May Be Linked to Birth Defects in Brazil, Health Officials Say,” CBC news web site, January 14, 2016; http://www.cbc.ca/news/health/zika-virus-birth-defects-1.3403402.